On Thursday last, I attended an interesting talk on “Inbound Marketing” with Hubspot’s EMEA Marketing Director, Kieran Flanagan and Director of Marketing, Kipp Bodnar, who both discussed inbound marketing from a sales point of view. In all my time attending and organising events, I’ve never attended a talk dedicated to these two topics (inbound marketing and sales). It was jam-packed with useful information and rather than regurgitating it all here, I’ve decided to cover just two really awesome points here and in another post here. 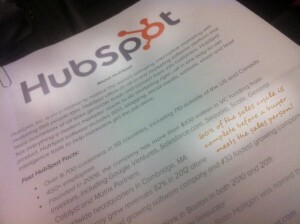 The Hubspot “Talk Series” will hopefully be a monthly event at their offices on the Quays, so do come along. You’ll definitely learn something. Over 65% of European consumers research online before making a purchase. 60% of the sales cycle is over before a buyer even meets the sales person! This really hit home as it compounded a point made by Dan Pink. The crux of Pink’s point rested on the idea that back in the 70’s a consumer relied on the salesman to educate him about a service or product before making a purchase. In todays hyper connected market, we can research car types online, read reviews and gather content from friends – a “social education” if you will. The consumer can no longer be steamrolled – they educate themselves and have the opportunity to debate facts and we, as marketers need to ensure our content is educational, helpful and engaging. For starters at least! To summarise, your customer is researching your service or product online, so make you have a presence online that customers will love and respond to. Social education is a bigger part of the buying process nowadays, so ensure that your customers are happy and if not, find out why!